Rhonda Fannin, director of workforce services at the Hillsboro Ohio Means Jobs office, reviews employment data in her office on Friday. The September jobs report released Friday morning by the U.S. Department of Labor showed the U.S. economy added 134,000 jobs during the month, while the unemployment rate fell to a new generational low of 3.7 percent, the lowest in 49 years. 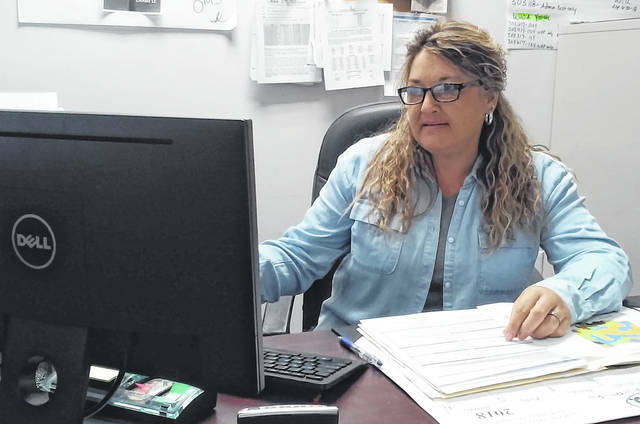 Rhonda Fannin, the director of workforce services at the Highland County Community Action Organization’s Ohio Means Jobs office said those low unemployment figures have helped boost the number of available jobs in the area. According the Ohio Department of Labor, the Buckeye State’s jobless rate was 4.5 percent. Highland County registered 5.3 percent, an improvement from previous months. Both Clinton and Brown counties were at 5.1 percent, and Adams County was at 6.7 percent. Fayette County had the lowest jobless numbers, coming in at 3.9 percent. Earlier national estimates from Bloomberg forecasted non-farm payrolls rising by 185,000 in September, while the unemployment rate was expected to drop to 3.8 per cent. Fannin told the Times-Gazette that the Jobs Ohio Network posts the latest employment trends to help job seekers see who the top employers are. She said keeping track of trends and the volume of job postings is important, since her office is also involved in training, and staffers want to make sure when an individual finishes a training program that there are ample jobs for them to apply for. Fannin said Highland County has many people that cross county lines to go to work, so some of the job postings at the Hillsboro Ohio Means Jobs office may include employers in neighboring cities. The list of employers actively hiring includes the Mason Company in Leesburg, which is looking for welders and advanced manufacturing associates, and she said that Aviant in Greenfield and Candle-Lite in Leesburg are always taking applications. Fannin praised the Highland County Commissioners for their efforts in recent years at bringing new business to the area, citing the arrival of Harbor Freight in Hillsboro and Corvac in Greenfield as examples. In Friday’s report, wages were also being closely tracked, with Bloomberg indicating those numbers were in line with expectations. Average hourly earnings rose three-tenths of one percent over last month and 2.8 per cent over September 2017. August’s job gains were also revised significantly higher in Friday’s report, with the bureau of labor statistics now estimating the economy created 270,000 jobs in August, 69,000 more than previously estimated. Over the last three months, job gains have averaged 190,000 per month. Friday’s jobs report also showed that the broader under-employment rate, which counts those that are out of work as well as those working part-time but who want a full-time job, rose slightly to 7.5 per cent. The labor force participation rate was unchanged last month at 62.7 per cent.